This recipe was inspired by one of my favourite cookbooks, ‘A Year in My Kitchen’ by Skye Gyngell. It’s a beautiful book in every sense of the word – the recipes, the writing and the photography. 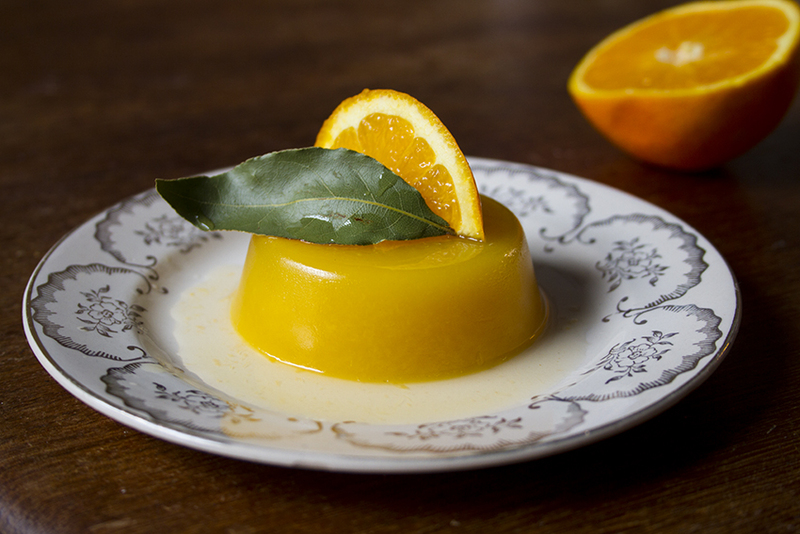 Skye Gyngell’s recipe is for blood orange and rosemary jelly. I make mine with other sweet orange varieties (like navel or valencia) which are readily available, but I have also used blood oranges when in season. I replace the rosemary with fresh bay leaves (we have numerous bay trees growing in our garden – they are prolific multipliers) and find that they add a lovely bittersweet floral scent and an ever so delicate flavour to the tangy orange. You can use dried bay if you can’t get hold of fresh leaves but use less as they have a more concentrated flavour, as with all dried herbs. My recipe uses considerably less sugar than most others – just 2 tablespoons – so it’s relatively child-friendly for a dessert, especially for a jelly. Blood oranges can be more tart than other types of sweet oranges as they contain hints of raspberry in their flavour profile. 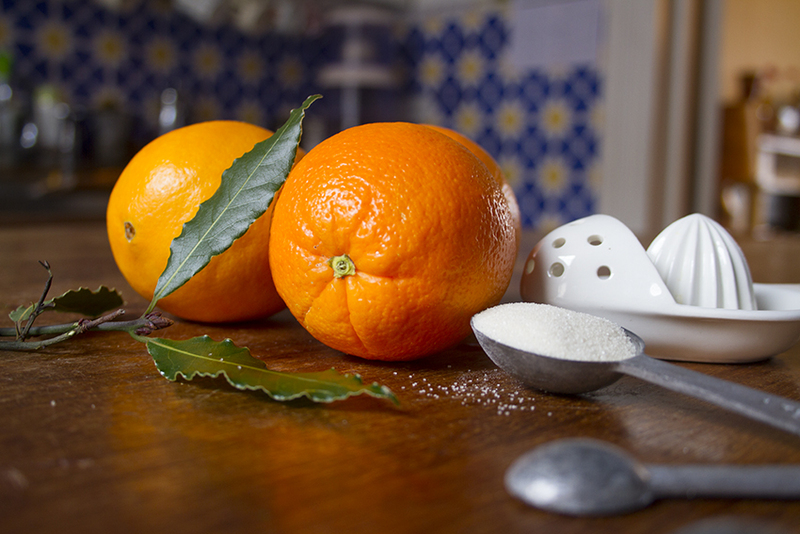 So when using the sanguiferous variety you could up the sugar content of my recipe if you want to (Skye Gyngell recommends 100g of caster sugar for 600ml of blood orange juice). This is an incredibly easy and quick recipe, and looks beautiful on the plate – meaning it’s perfect for children to help make or a cute little number to put together for a grown-up feast. The jelly is best served on the day it’s made but will happily sit in the fridge overnight to be gobbled up for lunch the next day. Also, it’s worth noting that I personally use vegetarian gelatine in the form of agar agar although my recipe denotes amounts for agar-agar, leaf and powdered gelatines. Agar agar is a mixture of complex carbohydrates (rather than animal proteins) and minerals derived from gelidium seaweed species of Red Sea algae. It gives you a more set and chewy jelly compared to the silky, melt-in-the-mouth jellies you get from using gelatine. 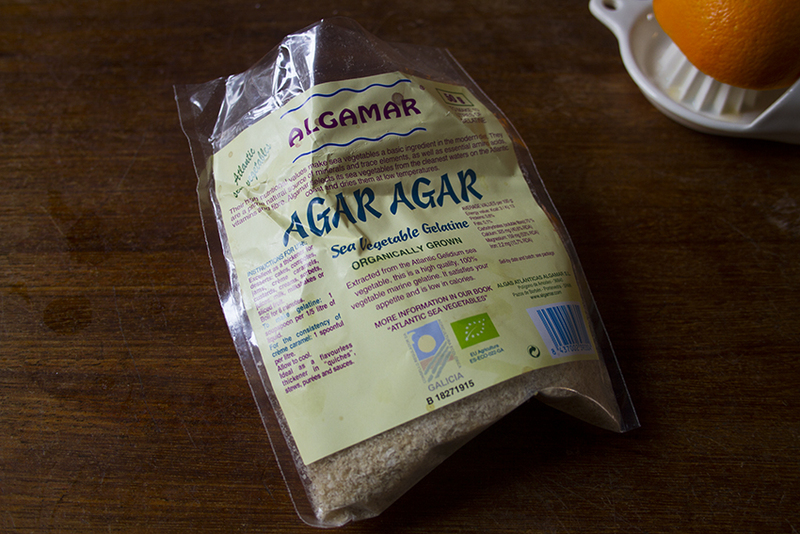 (Find out more about agar agar at this great site). However, do refer to the instructions on all vegetarian, leaf (or sheet) or powdered gelatine packets as strength differs from product to product. Lightly crush your bay leaves (or bay leaf, if using dried) between your fingers to release their flavour and scent, which will infuse the jelly. Add the bay to a saucepan and pour on the orange juice and sugar. Place the pan over a gentle heat, stirring occasionally to dissolve the sugar. 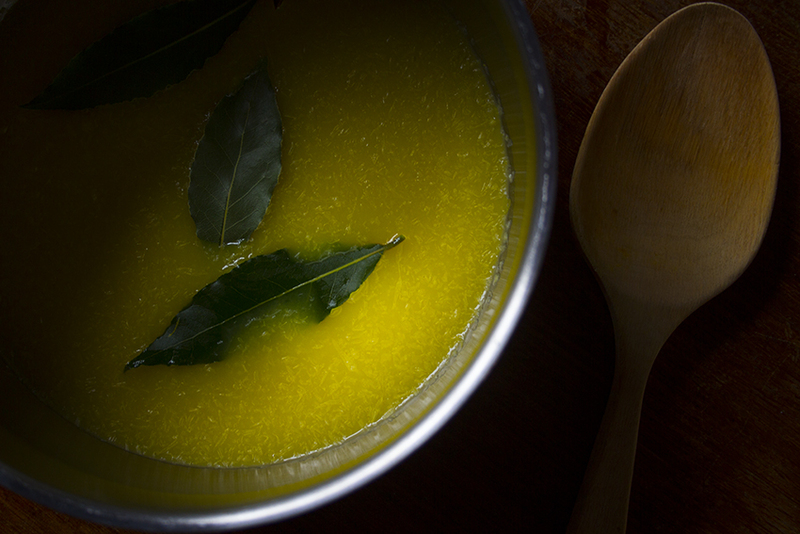 Whilst your pan is heating, and if using leaf gelatine, soak the gelatine sheets in a bowl of cold water for 5 minutes. Then remove from water and squeeze out excess liquid. If using powdered gelatine follow the packet instructions for use. If using agar agar, soak in cold water and remove after 5 minutes but then add to the saucepan and boil together with the juice, sugar and bay for another five minutes – this activates the setting agents in the agar (gelatine has a lower setting temperature so you never add gelatine to liquid if it is still boiling). Once your juice has come to the boil, remove from the heat and add the gelatine (if you’re using agar agar skip this step as you have already added your setting agent). Stir to ensure the gelatine has completely dissolved. Then, using a sieve, strain the juice into a jug to remove the bay leaves and pith. 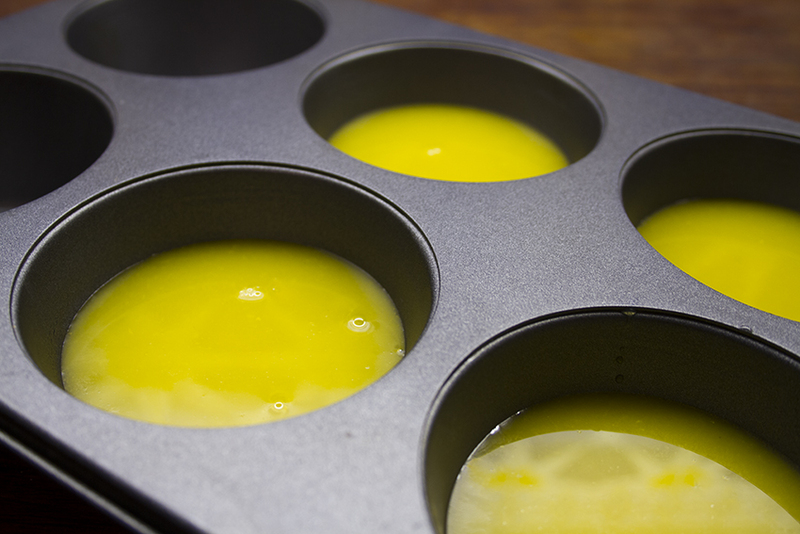 Using a little oil, wipe round your moulds before pouring in the warm liquid. Set aside to cool completely and then pop in the fridge for a couple of hours to set. When ready to serve (ideally on the day you make them), briskly dip the bottom of the mould (or muffin tray) in warm water and run a palette knife around the edge of the jelly to dislodge. Squeeze a little juice and place a slice or two of orange (peel and pith removed) on each plate, and complete with your little wobbly jelly balanced atop. When my son Reuben was tiny he suffered from Gastroesophageal Reflux. There are many ways to treat this not-uncommon condition in infants – ranging from pharmaceuticals through to probiotics, positioning and homeopathy – and what is prescribed depends both on the gravity of the condition and the opinions of the child’s parents and/or caregivers. Although Reuben was prescribed medicine, we chose not to medicate him, and instead sought a variety of non-pharmaceutical aids. Hand-on-heart, I will attest that – aside from the infant probiotics (which did wonders, I tell you) – our most efficacious approach was simply my diet, and the changes I made to it as a breast-feeding mother. Six months ago, I stopped eating dairy products (both infant and adult reflux has been linked to dairy for some time), refined sugars and caffeine, and – short of indulging at a wedding, barmitzvah, shiver (purely out of respect, of course), or the delightful Colonna & Smalls coffee house in nearby Bath – I doubt I’ll ever gobble another bowl of macaroni cheese (sob), guzzle a bag of milk chocolate buttons, or sup a cup of freshly roasted coffee again. Yes, seriously. And it has been amazing. The following recipe is both dairy- and sugar-free and offers a dense, sweet and moist cake. It is also incredibly child-friendly because it doesn’t contain refined sugars (which kids eat far too much of nowadays) and introduces little ones to the idea that puddings can be made using vegetables. My recipe is an adaptation of a lovely one that I found on the Heavenly Cakes blog – thank you Heike. You can read it here. Preheat your oven to 350°F / 180°C / gas mark 4 and then oil and line a 30cm round cake tin with baking parchment. In a large bowl, sieve together the flour, baking powder, cinnamon and nutmeg. Then, in a second bowl, combine the grated carrots, orange zest, oil, eggs, salt and agave syrup. Tip the wet ingredients into the dry and carefully mix together. Finally, fold in the ground nuts. Pour the batter into your cake tin and bake in the oven for around 50 minutes or until the top is a golden colour and a skewer comes out clean. 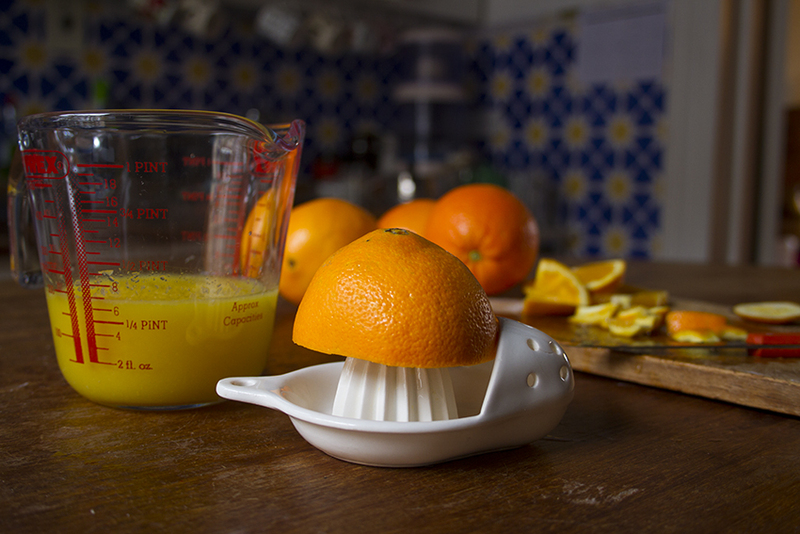 Whilst your cake is baking, squeeze the juice of the orange into a jug. Leave your cake to cool in the tin for a few minutes before turning out onto a wire rack. Place a large dinner plate under the rack and, using a skewer, pierce 7-10 holes evenly around the top of the cake. Lastly, drizzle the orange juice over the top of the cake. I’m in the final trimester of my second pregnancy and I have a vivacious toddler to fuel, so what better way is there to treat us both (and ply her with healthy seeds and dried fruit) than with some chunky, chewy flapjacks. Thank you to Smitten Kitchen for sharing her fabulous recipe, which itself is a version of one from the King Arthur Flour website. Here is my own take on this recipe (whereby I have adjusted measurements, cooking times and temperature, and substituted ground oats for ground hazelnuts, granulated sugar for caster sugar, corn syrup for golden syrup, and opted to use a crunchy nut butter for added texture). Preheat your oven to 190°C / 170°C (fan assisted) / gas mark 5. Line a 30cm x 12cm / 12″ x 8″ baking tray with baking paper (I use a brownie tin) so that the paper spills out over the edges of the tin. Lightly grease the paper with butter or oil. Bring all the dry ingredients together, including the fruit and nuts, in a large mixing bowl. (I chop up the fruit and nuts by hand so that I get nice little, randomly-sized, chunks of each. But you could also use a food processor.) In a separate bowl, mix together the melted butter, maple syrup, golden syrup, and water. Pour this liquid into the bowl of dry ingredients, followed by the peanut butter, and stir together until the mixture is evenly coated. Next, simply tip the mixture into your prepared tin and – using the back of a spoon, a palette knife or your fingers – press down to ensure that it gets into all the corners of the dish and has a vaguely flat top. Bake for 25 minutes, or until the top and edges of your flapjacks are golden brown, and leave to cool on a wire rack. (They should still be soft to the touch when you press down upon the top but they will set as they cool.) I then leave to cool for another hour in the fridge before turning out the tin onto a surface, removing the baking parchment and, using a serrated knife, cutting into generous squares. Store in an airtight container. These flapjacks can also be frozen and last for a few days (if you haven’t scoffed them already) if kept in the fridge. * Suggested mix: 10 chopped dried apricots (I like mine unsulphured), 5 soaked and chopped prunes, small handful of goji berries, handful of chopped up dried apple, two handfuls of seedless raisins, large handful of sunflower seeds, handful of dessicated coconut, sprinkling of brown linseed, and a small handful of sesame seeds. The mix I use is toddler friendly (so no whole nut pieces) but you can add almonds, cashews or whatever you fancy/find in your cupboard.